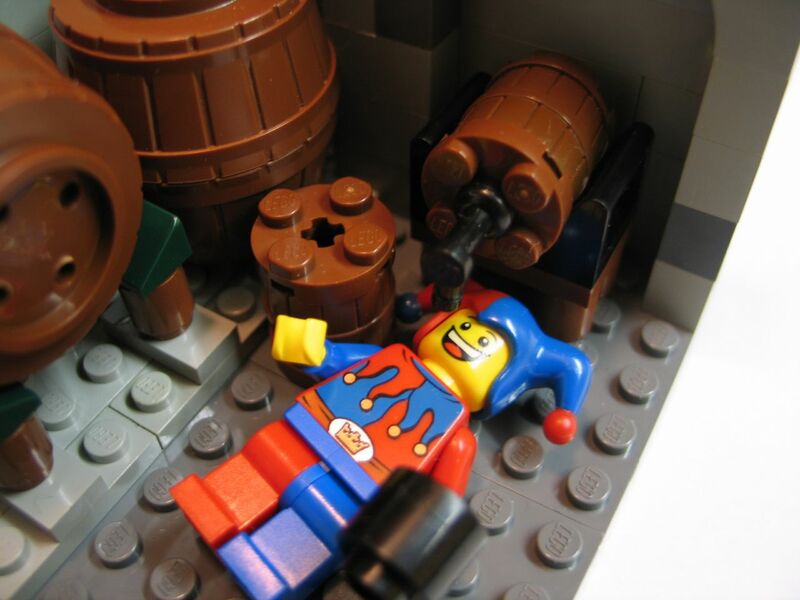 There has been rumors that someone sneaks into the Kings wine cellar at night and empties the casks. People are starting to wonder if the nightly foe might also be able to make the largest of the kings barrels any lighter. I have't seen anyone use this approach to make big barrels, so i thought I'd post a moc just because of that. There may be people that have done it. I just haven't seen it. Edit Greenglo used a similar technique (expanded in the middle) in his CCCVI entry. I had my brother-in-law (SirJakob) home for a short visit form Australia, and we sat in the basement building mocs yesterday. It was fun. This is what i scrambled together. I notice now that i forgot to add flat tiles up-around the ledge where the barrels are.. perhaps i'll update the photos at some stage. Both techniques in one pic. Edit: Greenglo's technique with the new barrels. Last edited by melonkernel on Tue Mar 03, 2009 6:49 am, edited 13 times in total. I love that barrel building method! Looks great - far better than the big Western barrels. I must give it a go myself! 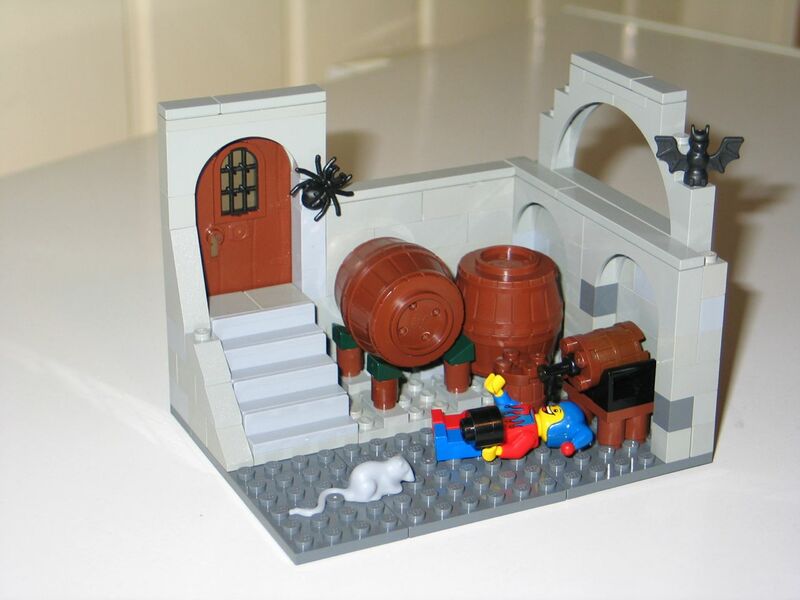 Brickzone wrote: I love that barrel building method! Looks great - far better than the big Western barrels. I must give it a go myself! Yes, I too am pleased with the way the large barrels are presented . Nifty way to solve the "open top" issue. Well done. Nice barrel construction, and a nice scene! 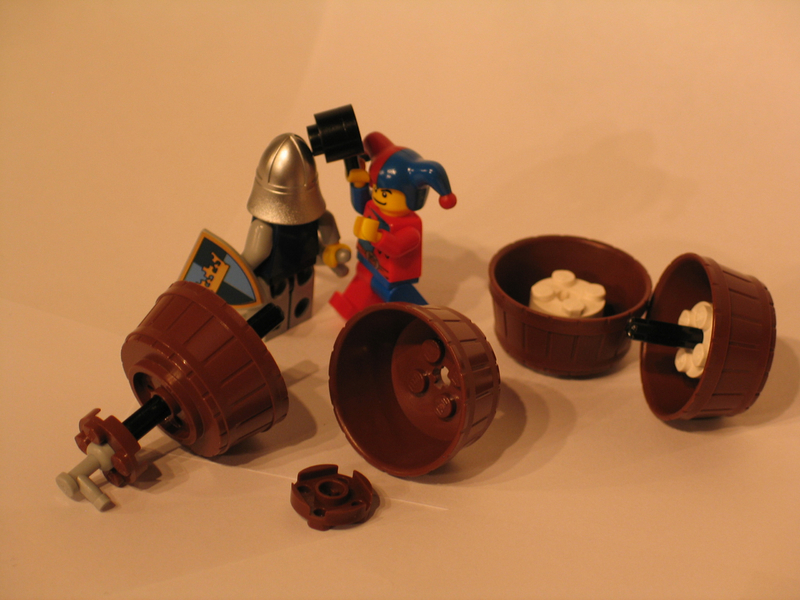 I got my medieval market village yesterday and noticed that the the "buckets" there have a technic cross-hole in the bottom. So to make a barrel out of those you could skip the 2x2 round bricks. And perhaps even make a nice tap for the barrels. That's a great idea. I did a similar thing a few years ago, at least it ends up looking the same. But yours is way simpler. In fact, that is one of the signs of a great technique, when it makes me wish I'd thought of it! That's a great idea! When I first saw the moc, it didn't even register that a large barrel piece doesn't exist. They just looked so perfect! I'm not sure how it'd look, but if you inserted a brown 2x2 plate into the bottom (top?) 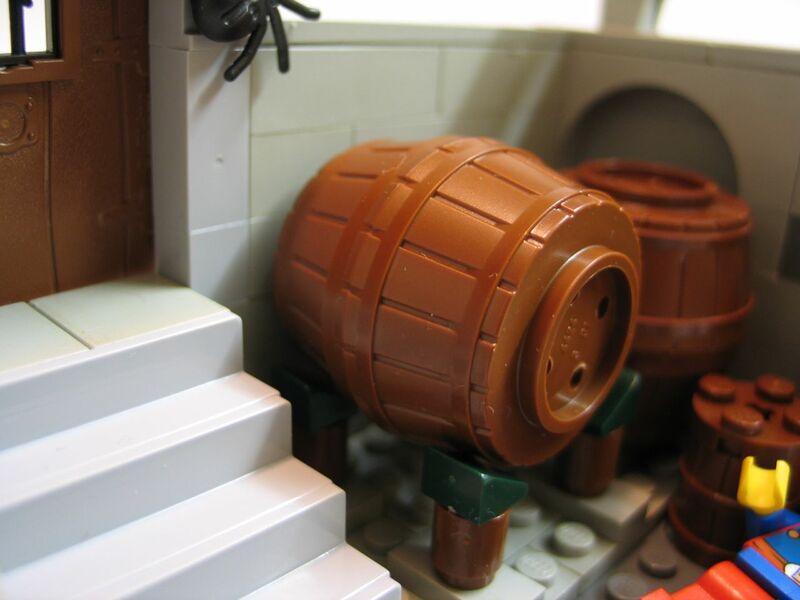 of the barrel, you could attach a tap. Granted, it'll be a little backwards, but at least it'd be there. Good job, I'll be copying this for sure. Just wanted to point out that Greenglo used a similar technique (expanded in the middle) in his CCC entry. Bruce N H wrote: Just wanted to point out that Greenglo used a similar technique (expanded in the middle) in his CCC entry. O, how nice. Hadn't seen that one. SavaTheAggie wrote: I'm not sure how it'd look, but if you inserted a brown 2x2 plate into the bottom (top?) of the barrel, you could attach a tap. Granted, it'll be a little backwards, but at least it'd be there. It looks quite ok, but it keeps falling off all the time, so i left it out from the moc. Seikfreid wrote: That's a great idea! When I first saw the moc, it didn't even register that a large barrel piece doesn't exist. They just looked so perfect! 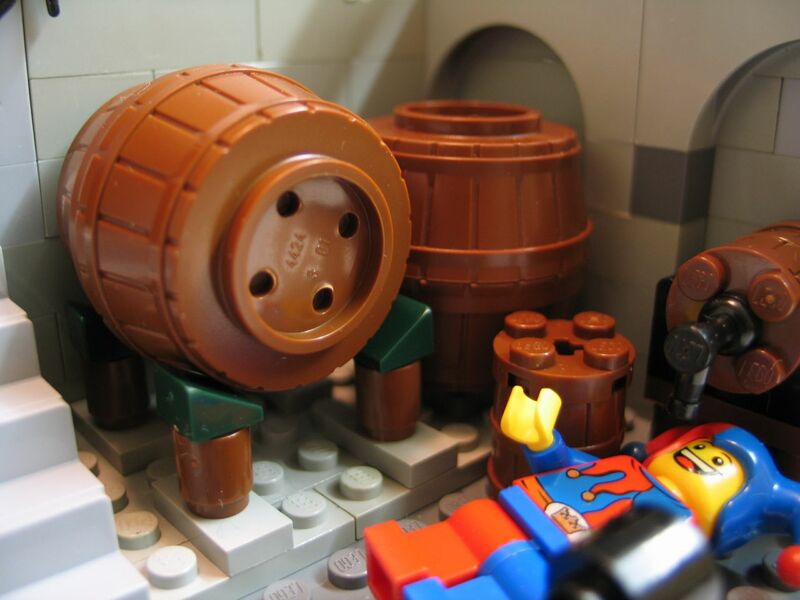 I feel the same actually, and the barrels were the reason i made a moc to put up here. 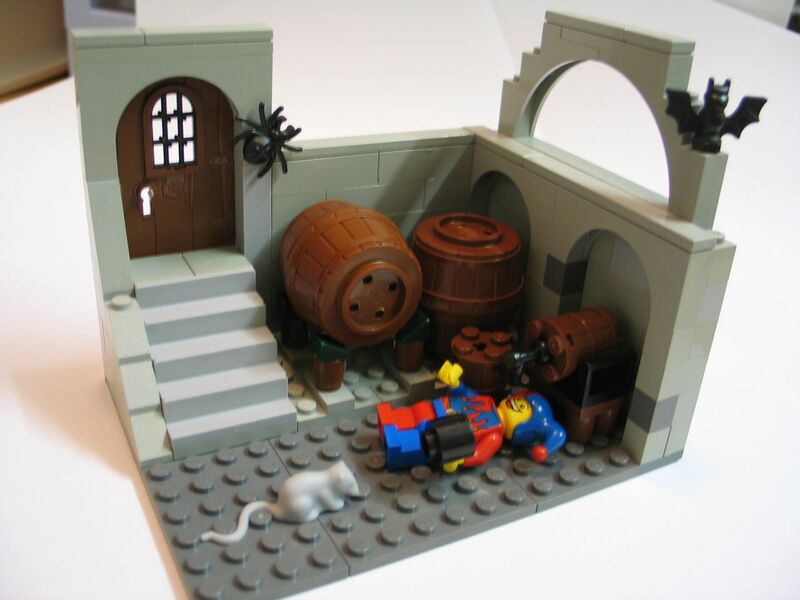 It is my first moc i put up in this forum actually. Nicely done. I like the dark green cheese holders for the barrels. I still gotta get me a MMP! Great minds think alike! This is a great step forward in keg design. greenglo wrote: Great minds think alike! This is a great step forward in keg design. Thank you very much. I just realized it was you who made the CCC entry with the expanded kegs that Bruce referred to. Sorry for not realizing it earlier. 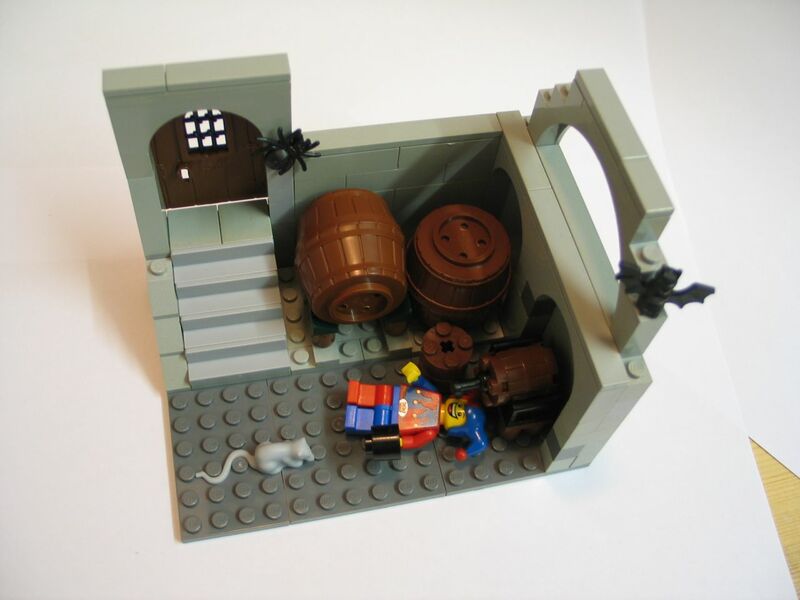 I feel very honored, and couldn't have made anything like our MOC. Did you btw use a similar technique? The new, red-brown half-barrel piece has a technic axle hole on the bottom, so your axle could be extended through the barrel, and connected to the 2x2 round plate... then covered with a tap.